Boston 1775: The Desk Calendar Contest Answers! Here are the answers to this week’s Desk Calendar Challenge, challenging readers to identify men related to the American Revolution who were named either William Smith or John Robinson, for the most part. 1) Member of Parliament and Secretary of the Treasury in London from 1770 to 1782, he was Lord North’s principal political fixer. This was John Robinson (1727-1802). The phrase “before you can say Jack Robinson” appeared in the late 1700s, so some authors have theorized that it referred to this man, but that seems unlikely. 2) Aide-de-camp to Gen. John Sullivan, Gen. Lafayette, and finally Gen. George Washington, he served as a diplomat and a Congressman, and became an in-law to John Adams. 3) An officer in the Westford militia company in 1775, he took part in the provincials’ advance toward the North Bridge without his men. 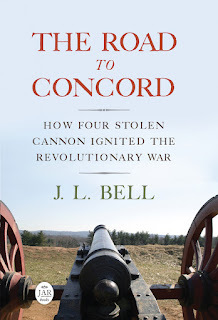 Eleven years later he returned to Concord to help close the county courts during the Shays’ Rebellion. 4) Appointed a Commissioner of Customs, he went into hiding after a coffee-house brawl and sailed secretly to London with a set of pro-Crown reports about the Boston Massacre. Another John Robinson (died before 1783). He was the man who clubbed James Otis, Jr., in 1769. Wondering whether this guy surfaced at Lord North’s side made me notice how many John Robinsons there were. 5) A historian of colonial New York, he railed against the idea of an Anglican bishop for America and sought compromises between Patriots and the Crown. He served as Chief Justice of both New York and Québec/Lower Canada. 6) Born in Charleston, South Carolina, he spent the entire Revolutionary War as an attorney in England. Back in America, he was elected to the first five Congresses under the new Constitution. William Loughton Smith (1758-1812), as opposed to William Smith (1751-1837), who fought in the Revolutionary War, represented South Carolina in the U.S. House for only one term, and was in the opposite party. 7) Invited to America by Benjamin Franklin, he helped to set up both the University of Pennsylvania and Washington University. He lobbied for an Anglican bishop for America and was driven from Philadelphia as a suspected Loyalist. The Rev. William Smith (1727-1803), shown at right. 8) By training a carpenter, he had to leave Cambridge, Massachusetts, after the “Powder Alarm.” After convincing the Crown to support a settlement at Penobscot Bay in Maine, where he owned land, he endured a siege by Massachusetts forces. This is our odd man out: John Nutting (1740-1800). 9) He’s one of America’s leading historians on the poor in the late colonial and early national period, particularly in Philadelphia. Billy G. Smith, Distinguished Professor of Letters & Science at Montana State University. 10) He died in office after serving for many years as both Speaker of the House of Burgesses and Treasurer in Virginia, and the government discovered he’d embezzled large sums of money. 11) Theologically liberal minister of the town of Weymouth, Massachusetts, he became an in-law to John Adams. The Rev. William Smith (1707-1783), father and tutor of First Lady Abigail Adams. Yes, John Adams’s father-in-law and son-in-law were both named William Smith. And the winner of the Colonial Williamsburg desk calendar for 2013 is commenter G. Lovely! Please send me an email with your surface-mail address, and that prize will be in the mail next week. I am surprised that you left out John Robinson the beloved pastor of the Pilgrims who died in Holland before coming to America. What's his connection to the Revolutionary period? My mind must have been dazzled by the sight of the Robinson tea chest spinning inside its Lucite cylinder. Well, Smith worked for Gen. Washington sometime during that range.